On Tuesday Anheuser-Busch responded to complaints over its support of the National Football League. 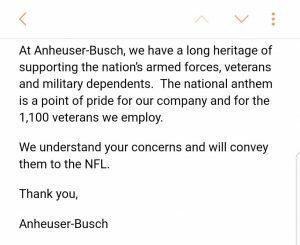 Anheuser-Busch said they will reach out to the NFL over their anthem protests. It doesn’t take a marketing genius to see what’s down the road if the NFL doesn’t get its act together. And fast. Previous articleWATCH: LeBron James Schools Trump Voters!